Be Brave, Keep Going: Alternative to Knott's Scary Farm - Camp Spooky! Alternative to Knott's Scary Farm - Camp Spooky! It's almost October. If you've lived in Southern California then you are well aware of the legendary Knott's Berry Farm scare fest called Knott's "Scary Farm". It's the only Southern California theme park that goes all out to scare the you-know-what out of it's guests. It's a 25+ year tradition during Halloween. Knott's hasn't forgotten about it's littlest guests, however. Knott's Berry Farm has a special annual October weekend celebration just for kids ages 3-11 called Camp Spooky. It's a "non-scare" fest full of cheer instead of fear. 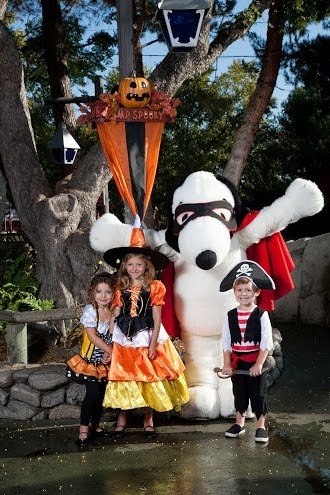 Kids will be able to participate in a variety of super spook-tacular events while at the park including "Snoopy's Costume Contest", cookie decorating, a special interactive maze just for kids called "Monster Factory", and much more.I'm on the hunt for some fun DIY costume ideas that can be worn at the theme park. The Peanuts gang is a regular fixture at Knott's, so I'm thinking a DIY Charlie Brown Shirt and Lucy dress might be fun. The kids are definitely excited. You can ready about my other Knott's Berry Farm trips including The New Log Ride and Boardwalk and Soak City OC. And you can follow the #CampSpooky hastag on Twitter and Instagram for a real time look at all the family fun. *Disclosure: I was not compensated for this post. Courtesy of GigaSavvy, I'll be attending Camp Spooky to share with you about Camp Spooky and Season Passes . All opinions are 100% my own.